Many changes have taken place in Online GIS and geospatial course offerings over the past year, since we first covered the topic on GISCafe. The range of topics has increased to include even courses for high schoolers, and the ever popular drone classes and Geodesign. The popularity of “Massive Open Online Courses” or MOOCs allows colleges and universities to teach thousands of students at one time, at their convenience, rather than at a prescribed day and time. Certificates are available for introductory education all the way up through graduate level work. Many online courses are offered within geography departments of universities and provide a lower cost and efficient way to study without having to leave home. Some online courses are free and others offered with scholarships and discounts to veterans and the military. What’s more, as we found in our first Online GIS Courses article, properly designed online courses have been found to be at least as good as, or often better than, resident courses, in study after study. Stewart Bruce, GIS Program Coordinator at Washington College talked about the program at their college, that is looking toward offering an expanded curriculum soon. “We will have anyone whose high school uses our curriculum, and follows our approved syllabus, to be able to have high school students also receive college credit. Since we are online any high school student nationwide whose high school does not offer GIS courses can take our online course while in high school as well. This also opens doors for home schooled students to take GIS courses and earn college credit. To be clear,” says Bruce, “we do offer our materials for free if a student just wants to learn. Anyone worldwide can gain access to our curricular materials under a Creative Commons non-commercial use license. The only limitation is we do not offer any kind of technical support nor college credit if you take the courses for free. If your goal is you just want to learn, and you are motivated enough to not need instructor help, then you can take the course on your own. Or perhaps your school can’t afford to purchase materials or support but you want to use the materials. Colleges and universities recognize the need for courses offered on specific software packages, since there are so many software packages and formats woven through the geospatial community. 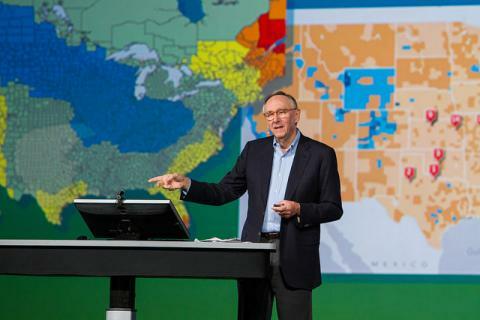 Of course, Esri has offered courses of their own for many years, most recently in the form of “Massive Open Online Courses” or MOOCs, outlined later in this article. Practical application of gamification can enhance understanding of terrain, landscape, road structure, cityscapes and buildings. Already some aspects of gaming are fueling 3D GIS visualization in products such as Google Earth and Esri’s CityEngine. Location analytics is another popular Esri online course. Trimble offers a number of courses through UNIGIS International with a focus on eCognition as the core technology behind the disruptive and radically innovative methodology of Object-Based Image Analysis (OBIA), introducing a new paradigm in remote sensing image analysis. In addition, Trimble software support courses in primary data acquisition – GNSS, and increasingly BIM-related technologies like SketchUp Pro and Professional photogrammetry software in advanced elective courses. This will be specific to UNIGIS students who follow their respective curricula, and software plays a substantial role in developing competencies in GIS. Active UNIGIS students appreciate the opportunity to work with professional Trimble technologies that are included as part of their study modules. The UNIGIS method of distance learning has evolved successfully over nearly 25 years, and is continuously adjusted to didactic, technological and leaner environments. Most courses involving Trimble solutions are not newly developed, but an example might be a core remote sensing course in a graduate geospatial program. UNIGIS programs over many years have graduated thousands of students, with MSc degrees or postgraduate certificates /diplomas. What Do You Get in an Online Course? Most of the online courses available involve an instructor available for a period of four to eight weeks, for individual as well as group instruction. A series of materials and videos are discussed and worked with, and written work and projects are assigned as needed. Some online courses are an adjunct to face-to-face courses. What some colleges say is that one of the advantages to online courses is community. Students are encouraged to work closely together, yet they have a tremendous amount of independence in the online learning environment. For younger students, online courses may provide a way to receive an excellent education, and not have to pay the high price of tuition and the living costs of attending a university face-to-face program. Many students may take additional and face-to-face courses such as geography, computer science or health care while taking online GIS courses. 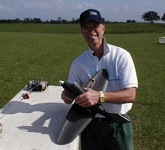 Kevin Shortelle, student at University of West Florida’s Online GIS program. Kevin Shortelle got interested in GIS as a result of his company’s need to orthorectify aerial imagery from the drones they were building for the U.S. Government. He took the University of West Florida’s Online GIS Program. The gaming industry now relies on GIS for real-world assets. “Gamification” uses GIS source data to create realistic virtual worlds, which opens up an entirely new industry segment for GIS professionals. Younger students who are familiar with gaming may grasp spatial concepts in GIS easier through gamification and all students who are most comfortable with visual learning. USC Dornsife’s GIST Program offers smaller class sizes, discussion forums, state-of-the-art software and database access, and videoconferencing tools for virtual face-to-face meetings with faculty and classmates. GIST thesis topics at USC have spanned the full suite of geographic information science and technology, including novel applications of GIS as well as implementations of web and mobile technology. Specific projects span a wide range of fields, including architecture, biogeography, business, geology, history, human geography, public health, natural hazards, planetary sciences, and sustainability. At the University of North Alabama, students earn a GIS Analyst Certificate and work in instructor-led online classes. During the class, they can ask questions of the instructor just as though they were in a traditional classroom setting. At Penn State, new offerings include the Online Masters of Professional Studies and Certificate in Geodesign, with courses offered in Geodesign History, Theory Principles. Geodesign Models (Evaluations & Decisions, Process & Impact, Representation & Change), Geodesign Studios (Rural/Regional Challenges, Urban/District-scale Challenges). Some aforementioned popular online offerings are their Python Program for GIS, LiDAR, and Cloud and Server GIS. They have recently created an all-new version of their Open Web Mapping course which focuses on contemporary Open Source web mapping technologies like OpenLayers, GDAL and TileMill. They have a course on Unmanned Aerial Systems (UAS) for Remote Sensing. Washington College provides non-credit online GIS for professionals in the form of introductory GIS through advanced topics such as Georeferencing and Density Mapping, but for K-12 efforts as well. Dover Area High School was awarded the U.S. Geospatial Intelligence Foundation’s Academic Achievement Award. The advent of “Massive Open Online Courses” or MOOCs has allowed universities to take enrollment from possibly 15-25 to thousands of students. This type of course will provide videos, written materials, manuals, tests that are posted weekly. Students can study them at their own pace. These courses do not have a live instructor and set class time, but are of interest to students on the go, who must collect materials and study whenever they get the chance. A number of MOOCs are available, including Esri’s Spatial Analysis MOOC, Open Online Education’s “Introduction to GIS and Mapping,” Simon Fraser University’s “Exploring Geographic Information Systems,” Nature Conservancy’s “Fundamentals of GIS for Conservation,” Penn State’s courses via Coursera on “Maps and the Geospatial Revolution” and “Geodesign,” and Elmhurst College’s 4-week Digital Earth MOOC. Esri’s Spatial Analysis MOOC is for people who know something about data analysis and want to learn about the special capabilities of spatial data analysis. Another course in Esri’s line-up of MOOCs is the following: The Location Advantage, which is designed for recent graduates and current students majoring in business. Location analytics is used by organizations throughout the world to improve their understanding of business processes, markets, and customers. This allows organizations to make critical business decisions more quickly while providing them with a competitive advantage. So far we are seeing online GIS courses offered by large universities, state universities, and some private colleges and individual GIS software providers. Some of these are using an online service such as Coursera or Desire2Learn (D2L Open Courses) to provide the framework for their online courses. Another option for students enrolled in online courses are satellite tutoring centers, where they can schedule an appointment for tutoring. Some criticisms of online education include the idea that fewer tenured faculty members will be hired to teach them, as online courses can be taught by contracted faculty or tutors. Maybe that isn’t an issue, if the demand for face-to-face education continues. And some faculty members may enjoy balancing face-to-face education with online. For students, the lack of an “in-person” experience and the lack of networking with other students on a similar career path may be of concern, although most universities today encourage online students working together. As part of the USC Dornsife GIST Online program, the course also includes a one-week field excursion to Catalina Island to obtain practical field experience in spatial data acquisition, and gives students the opportunity to work together and with faculty to enrich the online experience. One respondent said that the best format for online is hands-on exercises where students can use real GIS data and various software programs to apply critical thinking and problem solving skills, to address a series of multidisciplinary geospatial challenges. In the responses we received to our questionnaire, all respondents felt that the online GIS experience was beneficial to all students. Some universities felt that the online experience offered a richer learning experience than face-to-face, as long as the courses were developed and presented well. Clearly, since GIS is being used in many different industries including health care, real estate, disaster planning, business, defense, and city and site planning, many more organizations are seeking people with GIS skills. And while some GIS applications become easier to use and don’t require a degree or certificate in GIS, there is still a great need for those who are degreed in GIS to take over positions such as GIS managers, spatial analytics directors, city and land planners and analysts. In business, GIS is being used increasingly as a business intelligence tool for interfacing with ERP and CRM in large organizations. The need to use location data and spatial analytical data with other data types is a driver to send professionals back to school to learn new skills. As we review the opportunities in online curricula for 2015, it would appear that the criticisms of online GIS studies have diminished as more positive data is accumulated and proves that the learning is very valuable. The expanding world and demand for UAS, mobile, Geodesign, 3D and virtual worlds professionally drives the need for education, that cannot be satisfied by students simply sitting in a classroom. That, and the sheer volume of students who wish to learn, will carve out the new order of learning for the next GIS generation. Courses Offered: Geodesign History, Theory Principles. Geodesign Models (Evaluations & Decisions, Process & Impact, Representation & Change), Geodesign Studios (Rural/Regional Challenges, Urban/District-scale Challenges). Students: Professionals who want to remain in place while gaining new skills in collaborative leadership. Based on proven techniques, Geodesign helps to address some of the world’s most pressing problems. Costs/Tuition: Online MSGISc students will be eligible for a discounted tuition rate at 49.9 percent of the “on campus” tuition rate. Courses Offered: Courses within the UNIGIS network will satisfy professional development needs and are ideal for in-service training. The curriculum is structured in learning modules, requiring 6-10 weeks of work each. Module topics cover Spatial Data Models, Databases, Spatial Statistics, GIS Analysis, Visualization and Cartography, Application Development and Interoperability/SDI; plus elective subjects like Remote Sensing, various GIS application domains, LBS, GPS etc. Students: The UNIGIS International Association is the world’s premier distance education initiative offering masters and postgraduate diploma / certificate programs in Geographical Information Science and Systems. UNIGIS alumni become an integral part of a widespread and international network of professionals engaged in various branches in the extensive field of GIS. Our institutional, business and industry partners support students to meet the demands of the GIS job market through free or discounted learning materials, books and software. Costs: For specific questions, contact UNIGIS directly (http://www.unigis.net/contact) or to request additional information, please visit (http://www.unigis.net/contact/request-information). Type of Virtual Instruction: Graduate programs use Blackboard learning management system. Professors are available for individual and for group work via remote video conferencing, phone, email, etc. Courses Offered: 4-week, online course designed to introduce how location technologies are used in society. Students: No prior experience with GIS software all the way to advanced users. Type of Virtual Instruction: Video lectures, discussion, quizzes. This entry was posted on Thursday, November 19th, 2015 at 10:44 am. You can follow any responses to this entry through the RSS 2.0 feed. You can leave a response, or trackback from your own site.